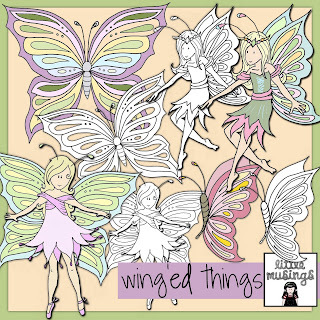 Morning, today over at little musings you can get yourself the most gorgeous digi set called 'wing'ed things' the set includes fairies and butterflies and they are all gorgeous, as always they come in black and white for you to colour or Sj has worked her magic and provided them in colour too, so all you have to do is print and go! So as my daughter loves all things fairy and butterfly I created, I say I but it was a joint effort as Izzy was sat with me during the process, choosing and 'helping' in her little persons way. We made some hair clips and a ring check them out!!! Right I am off to catch up on some house work and other things, have a great weekend! OOOH They are so very pretty! They are so delicate - the ring is brillant!